Yoga is a great way to increase your flexibility, strength and balance – all things that make moving around easier. It also helps you become aware of where your body is in space. This awareness is key to improving your orientation and mobility skills. 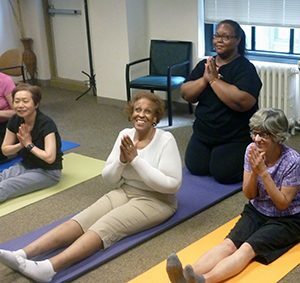 Second Sense is offering a weekly yoga class with certified instructor, Marilyn Green, who also has vision loss. increase relaxation and reduce stress. To participate, please wear comfortable clothing and bring a yoga mat. To register, please contact our front desk or email Kathy Austin.